Another first for Kimberly occurred today, the wearing of crampons to walk on water, frozen water that is. Robert & I were part of a organized tour which taught us how to ice climb on Perito Moreno. We traveled only about 3 miles out into the vast ice field, in not the best of weather (rain, snow and wind) but enjoyed getting “up close and personal” to crevasses and seracs. This also marked my furthest south point as of this time in the trip. A collection of GPS waypoints of our trek across the ice is shown below. The photo above shows the viewpoint of Lagos Los Tres, within sight of the magnificent Fitz Roy. One I won’t forget. Three glacier lakes with their milky sheen completed the scene as Robert & I enjoyed a stunning view as the clouds parted and the sun poked its head out. Our 15 mile hike this day (Feb 10), of modest ascent (we’d climb from 900 feet to 3900 feet), started off in rainy, cold weather. It was a jewel in surprise as it kept many of the hikers back and we found ourselves alone with the Magellanic Woodpeckers and the mountains, both which teased us with their beauty. El Chalten is a funny town, relatively new, being the result of land-claims in the mid 1980s by the Argentines from the Chileans. It was certainly a town in great flux with loads of building going on. Although not really teeming with tourists, the only industry in town is geared for the walker, the ice climber, the trekker, etc. with rental gear shops, guides, and package tours, along with the needed restaurants and hotels. We took in some local Argentine foods on our trip to the backcountry — Patagonian lamb and locro. The former is slow roasted in a spit all day and a common site in southern Argentine barbecue (asado) places. The latter was harder to come by, being a mountain stew of maize and anything you can think of that comes from a cow. It was a welcome treat after our second 15 mile hike (Feb 11) up to Laguna Torre to perhaps get a view of Cerro Torre, which alas, stayed behind clouds all day. Sunday Feb 12th brought us a slow day as we waited for the evening bus back to El Calafate. 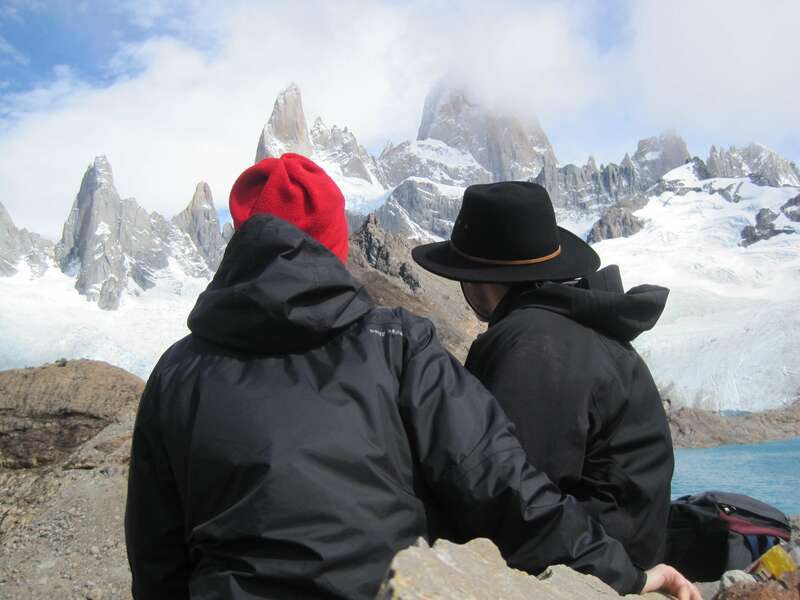 We took into some local hikes with panoramic views of the Cerro Torre & Fitz Roy ranges and enjoyed watching the Andean Condor glide among the cliff edges. 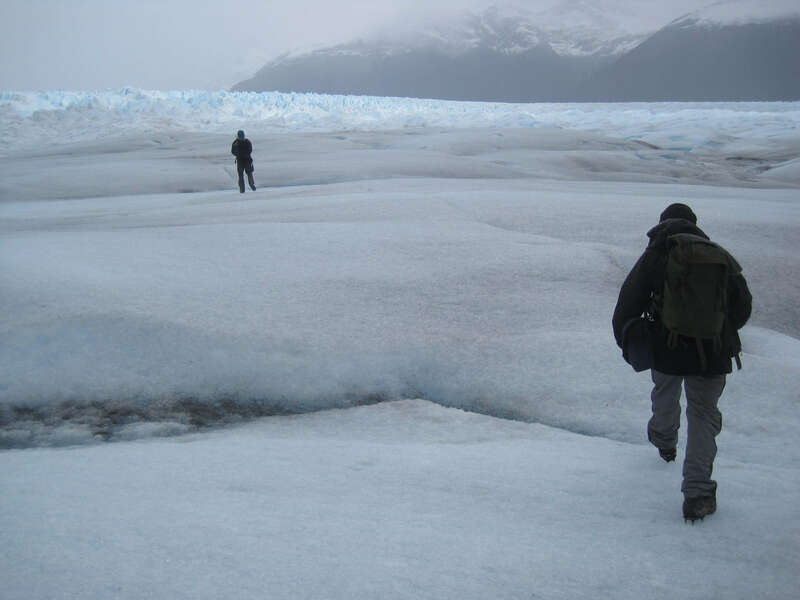 Celebrating Robert’s 40th birthday by visiting a most amazing river of ice, the Perito Moreno Glacier, located in the Los Glaciares National Park. 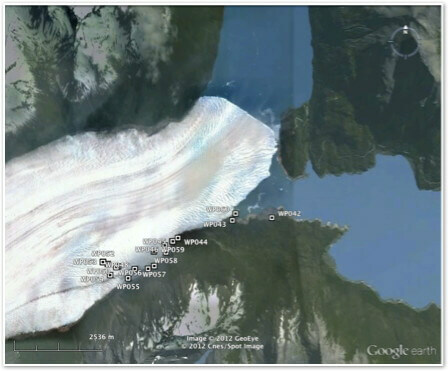 The specifications for this amazing natural beauty really boggle the mind: a 250 km^2 ice formation, 5 kilometers across, stretching over 30 km along the river, with heights of 60-80m above the water line, with an equivalent depth of ice below, or ~140 m ice height, half hidden from view. It was just mind-boggling to get a sense of scale. 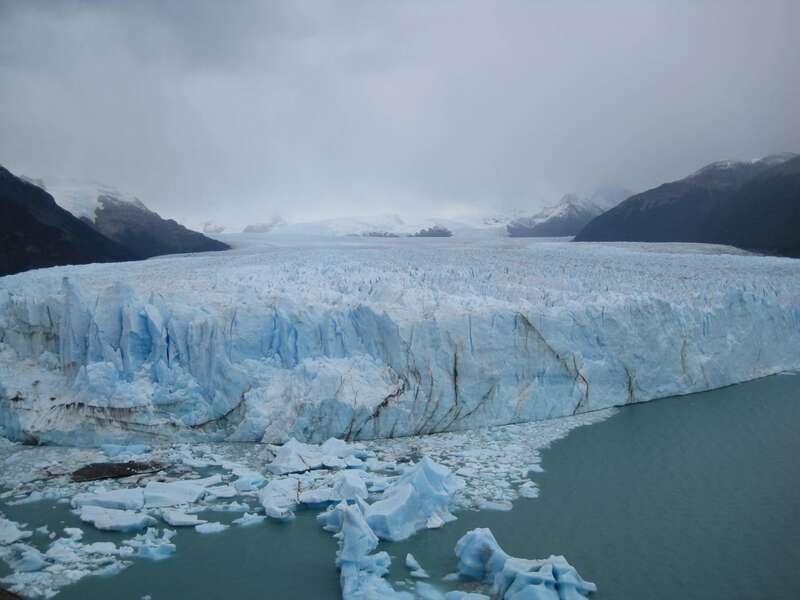 Unlike other glaciers in the area (fed from the Southern Patagonian Ice Field), which are retreating, Perito Moreno has basically kept its same volume over the last century. I just love things which are locked in time! We were fortunate to enjoy catching some times when the glacier ‘calves’ or falls into the lake that it abuts against. Throughout the afternoon, on the boat trip and also just walking the balconies where you got some amazing views, we would hear the sounds of the glacier. Or you would see waves being created by a recent ice fall. 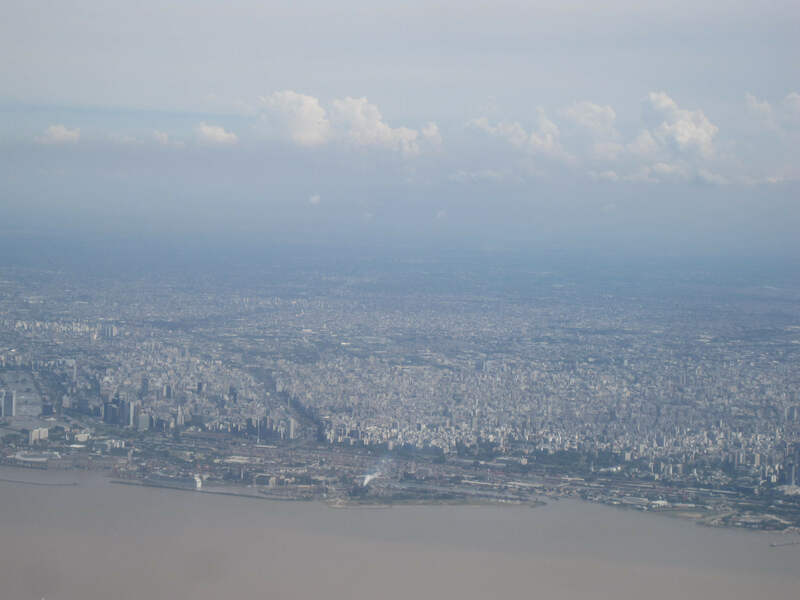 We had about four hours layover between arriving at the international airport Ibeza (EZE) from Houston, TX, USA, and transporting ourselves to the coastal (Atlantic) domestic airport Jorge Newbery (AEP). We pretty much almost used all of it, but we certainly had time to spare. I had not been prepared for the mugginess of B.A. I know it’s late summer down south, but with all the emphasis on having to pack lots of cold-weather gear for the Polar Pioneer and having left Denver, CO, USA, in a snow storm, cascading through a hot & muggy airport in winter gear, stripping as I went, will ever remain in my memory. On the bus ride across the city, we spotted lots of cars which had been pulled off the road in search of shade, even if the road was a four lane motorway. It had a sense of “organized chaos.” From my small viewpoint, there were loads of uncollected garbage in many places, having later been told that due to the current economy woes, various social services are running months behind. We did not, on this trip, neither outbound or return, spent some time in the colonial city. 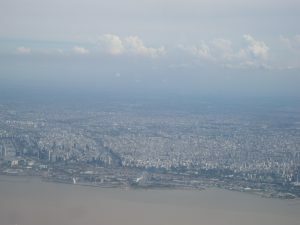 From the air, Buenos Aires stretches for miles and miles. At night, it lights up an area the size of a South American country. 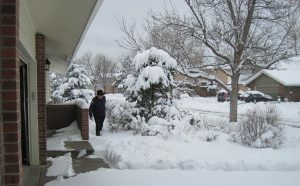 With over 18 inches of snow outside, from the recent storm that crested last Friday, Boulder, was, as ever, always too pretty to leave. Enough time had passed such that the roads were very clear and we hoped that the backlog at Denver airport to have also cleared. It had. Travel was rather uneventful, just long. I was glad to have Stephen Ambrose’s Undaunted Courage, a book abut Meriwether Lewis of the Lewis & Clark fame, tucked away in my hand luggage, keeping me & hubby company on a series of three bus, three airplane journeys to go south, the most south this Kimberly has been on this planet.